Without the Silph Scope, you can't identify the ghosts lurking in Pokémon Tower, and therefore you can't fight them. With the scope in hand, you can fight and try to capture these astral aggressors. Note that Normal and Fighting-type moves don't affect Ghost-type Pokémon at all, so use caution in battle. You'll have better luck catching a Gastly or a Haunter if you use Great Balls instead of regular Poké Balls. You can also find some Cubones here too. With the Silph Scope in your hot little hands, it's time to head back to Pokémon Tower and figure out what is going on. 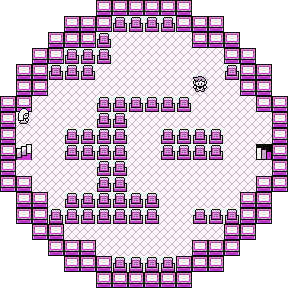 The quickest path (if you did not capture a Pokémon that can Fly after using HM02) is to go back to Route #7, hand the guard a frosty beverage to end the baffling "Thirsty Guard" crisis, and then cut through Saffron City on your way East to Lavender Town. On your way through Saffron City, you might just want to stop in at the Poké Mart and grab a Super or Max Repel. 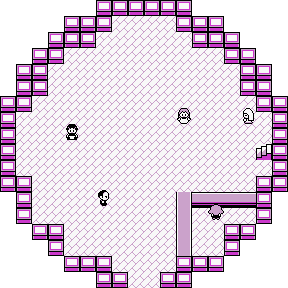 The Repel is for the Tower, where you'll be assaulted by Gastly, and occasionally Haunter. When your rival gets in your way on the second floor, he'll pick a fight as usual. Like some of the previous battles, he isn't going to be that hard on you, so again you should have an easy time. If you're playing the Red or Blue cartridge, he might have an alternate lineup (a level 25 Pidgeotto, a level 23 Gyarados/Exeggcute/Growlithe, a level 22 Growlithe/Gyarados/Exeggcute, a level 20 Kadabra, and the starter Pokémon he chose at the beginning of the game in it's first stage evolution). Gyarados is absent if you select Charmander, and your rival will have a level 23 Growlithe and a level 22 Exeggcute in his lineup. Exeggcute is absent if you select Squirtle, and your rival will have a level 23 Gyarados and a level 22 Growlithe in his lineup. Growlithe is absent if you select Bulbasaur, and your rival will have a level 23 Exeggcute and a level 22 Gyarados in his lineup. In the Yellow game, he'll be a little more formidable. Besides his Fearow, Shellder, Magnemite and/or Vulpix and Sandshrew, your rival will also use his Eevee, which he will soon evolve into a Flareon, Vaporeon or Jolteon. Shellder is absent if your rival is going to evolve Eevee into Vaporeon, and your rival will have a level 23 Vulpix and a level 22 Magnemite in his lineup. Magnemite is absent if your rival is going to evolve Eevee into Jolteon, and your rival will have a level 23 Shellder and a level 22 Vulpix in his lineup. Vulpix is absent if your rival is going to evolve Eevee into Flareon, and your rival will have a level 23 Magnemite and a level 22 Shellder in his lineup. Electric attacks on the Gyarados (remember that it has a 4x weakness to them), Shellder, Wartortle, and the Flying-type Pokémon. Ice attacks (the recently acquired Ice Beam is an great option) on Exeggcute, Ivysaur, Sandshrew, and the Flying-type Pokémon. Water attacks on Growlithe, Vulpix, Charmeleon, and Sandshrew. Ground type attacks on the Magemite and use powerful physical attacks on Kadabra. The Eevee can be dealt with by using anything you have. Ghost-type Pokémon are completely invulnerable to Normal and Fighting moves, so many of your Pokémon's attacks will be useless here. Because of the only Ghost evolution line's secondary type, Poison, they are weak to Psychic and Ground-type moves. Anything that can use Dig, especially a speedy one like Diglett, can pretty much get an instant K.O due to the Gastly and Haunter's poor defense stats. Pokémon like Kadabra and Drowzee are very powerful too. If you don't want to deal with lots of random encounters, just pop open the Max Repel... after you catch a Gastly for yourself if you want. Many Channelers also lurk this tower, and they seem possessed. average rate of the entire tower. 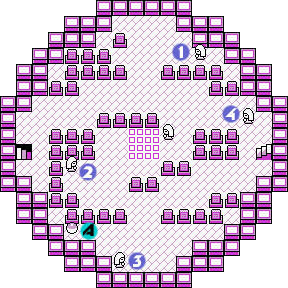 The leader of the Channelers has broken free of the dark power that held her, and created a reusable healing zone on the 5th floor. Make sure you heal and save while you have the opportunity, since there are a number of surprises ahead. Move one step forward and three steps down from the stairs to snag a hidden Elixir. Elixirs restore 10 PP for all moves for the Pokémon it is used on. The first surprise is at the stairway to the top floor, where the Ghost that you needed the Silph Scope for finally reveals itself as a level 30 Marowak. Make sure you have some strong Pokémon for this fight! It should be a pretty easy battle if you have Water, Grass, or Ice attacks. You cannot catch this Pokémon, as it will dodge any Poké Ball you throw its way, even a Master Ball! There is also a glitch where you can use a Poké Doll on the Ghost so you won't have to use the Silph Scope to fight it at all, allowing you to completely skip the Rocket Hideout if you want. More non-Gastly foes await on the top floor and they're from Team Rocket. 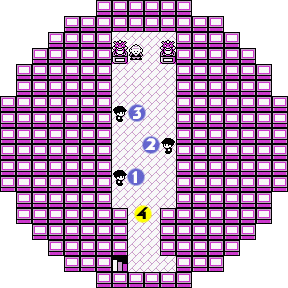 Red and Blue players have to go through three Rocket guards, while Yellow players just have to deal with a single visit from Jessie and James, the pair of losers that's been trailing you all along. Prepare for trouble...make it double! Didn't you just pummel these guys at the Game Corner? No sooner have you defeated the ghost guarding the 7th floor in the Yellow version than Jesse and James show up again, trying to keep you from talking to Mr. Fuji. Their Ekans and Koffing have evolved into Arbok and Weezing, but you should still win the battle easily if you have a Psychic or Ground-type Pokémon. They'll run away, but don't think for a second that you've seen the last of these two troublemakers! After you've bested the Rockets, you'll find the missing Mr. Fuji. He'll thank you for your efforts with dealing with the Marowak Ghost which was the dead mother of a child Cubone, and will reward you with a gift of a Poké Flute, which you can use to awaken any sleeping Pokémon, and which finally makes that Rest skill useful. You can also use it to wake up that sleeping Snorlax that was blocking the passage between Route #11 outside of Vermilion City and Route #12 south of Lavender Town or you can wake up the sleeping Snorlax on Route 16 near Celadon City. You can see what's up ahead or you can pay a visit to Saffron City. They're weak to the powerful Psychic and Ground-type attacks, but their Normal and Fighting-type immunities more than make up for that minor inconvenience. They have very good offensive stats with a great Special stat and a top-notch Speed stat. The Gastly evolution line is similar to the Abra line with Special sweeper qualities but weak defenses (Abra is slightly better as a sweeper but Gastly is a little more sturdy). Gastly evolves into Haunter at level 25 and it is required to trade Haunter to evolve into the amazing Gengar. Gengar itself has a pretty good movepool. It learns useful status move such as Hypnosis and Confuse Ray while it can learn attacks such as Night Shade, Lick, and Dream Eater. Despite not so strong Ghost attacks, it also can learn useful special attacks such as Thunderbolt, Mega Drain, and Psychic. As adorable as they are rare, Cubones are seen infrequently in Red and Blue and almost never in Yellow (although in that version only, they're also found in the Safari Zone). The decent Ground-type skill Bone Club comes built in, but better attacks like Bonemerang and Thrash (which does heavy damage for 3-4 turns in a row, but confuses Cubone) don't come until higher levels. Cubone is better in Yellow, since he learns Headbutt at level 18! This page was last edited on 20 July 2014, at 17:58. This page has been accessed 921,602 times.